Positano, as pretty as a postcard. The town is a colourful, coastal, cliffside gem, and a tourist’s honeypot paradise. Situated on the stunning Amalfi Coast, the dream-like mountainside town of Positano is a real jewel of the region. It’s hard to believe that it was once a poor-mans fisherman’s village! As you wind through the cobbled streets and up the steps, you feel as if you are stepping inside a storybook (note here to remember to pack comfortable shoes!) and fully entranced into its Italian charm and natural beauty. 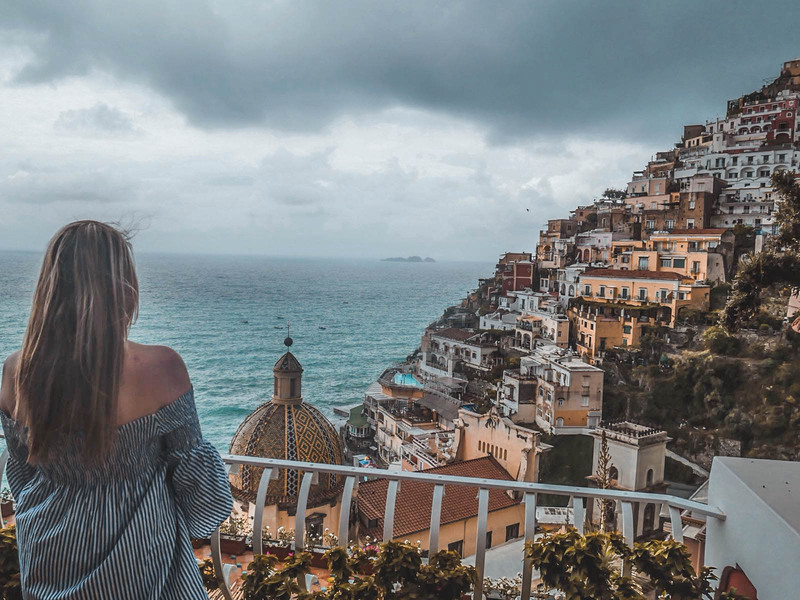 During our 3 day visit at the beginning of May, the weather was a real mix of heavy clouds, sunny blue skies and torrential rain, which meant that we had a lot of time to explore the area and naturally, visit a handful of Positano’s innumerable restaurants. If I had to pick a food to live off for the rest of my life, it would be, for sure be; Italian. I adore pasta, pizzas, cheese and bread, so being in Italy and being the foodie I am, my time was well spent eating my body weight carbs. 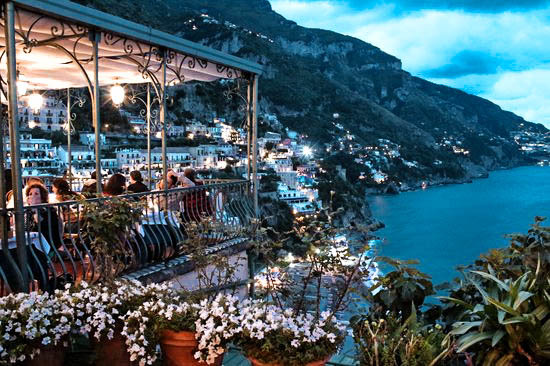 The renowned Cafe Positano is a great place to sit and relax for a long lunch or evening meal and take in the views of the Meditteranean. The cafe prides itself on having the freshest ingredients and wholesome food. For il primo, sample the fresh anchovies, their speciality, which is full of flavour, then treat yourself to the best Spaghetti frutti di mare you’ll probably ever taste! A hidden gem right in the heart of Positano. The fabulous panoramic terrace in the Hotel Poseidon backs on to the rainbow coloured buildings sitting pretty on the bay of Napoli. We went to Il Tridente for a long lunch to escape the rain, which made the view all the more dramatic. The menu was full of typical Italian dishes, and the food was incredible. If you are venturing to Positano, make sure Il Tridente is on your list. Upon reading amazing views about Chez Black, I set my expectations high – and boy, did the restaurant exceed them! 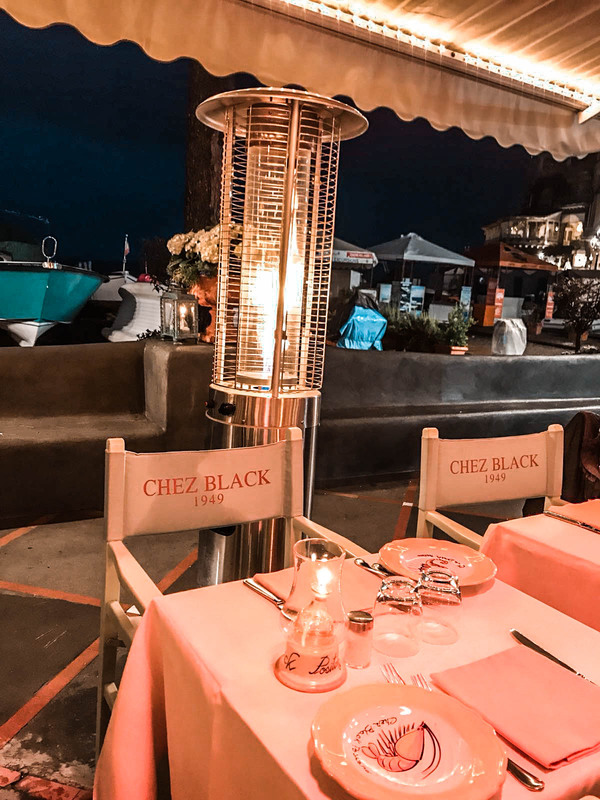 Founded in 1949 Chez Black holds a romantic story of how it came about (which you can find inside your menus) and has been a famous spot in Positano since. The atmosphere is great, and the tables are so close together you find yourself chatting with people from all over the world, which I found so lovely. The pizza I had for dinner was arguably the best pizza I had in Italy, in fact, ever! Another day, another pizza. Again, this restaurant holds another romantic story, with El Capitano dating back to the 50s and has been family run since. 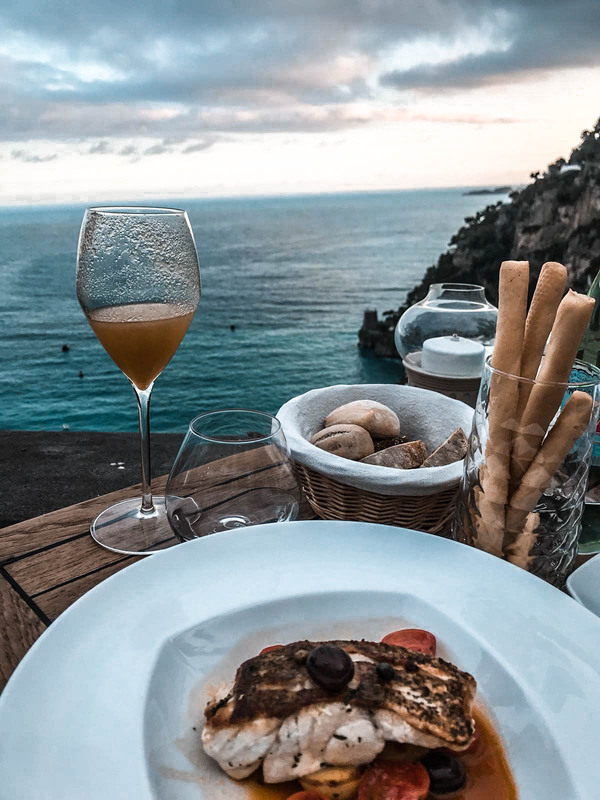 You are instantly drawn into to the amazing view the restaurant boasts, right on the knife edge of the cliff, with breathtaking views of the sea. Indulge in their fantastic pizzas, and their coffee & homemade cakes make for a perfect post-lunch treat too! For a taste of fine, delicate dining, head to Da Garbrisa for a sunset dinner. Watch the sun hide behind the mountains, and for nighttime to descend on the Amalfi. Set higher up on the mountain, away from the hustle & bustle, the restaurant is in a gorgeous setting with magnificent views of Fornilio bay. The chef offers amuse bouche to begin, all which is expertly prepared and beautifully presented. You can’t go wrong with seafood in Positano – and here you’ll find a great selection for your main course. To cleanse the palate after a meal, make your way to the Covo Dei Saraceni hotel for dessert. 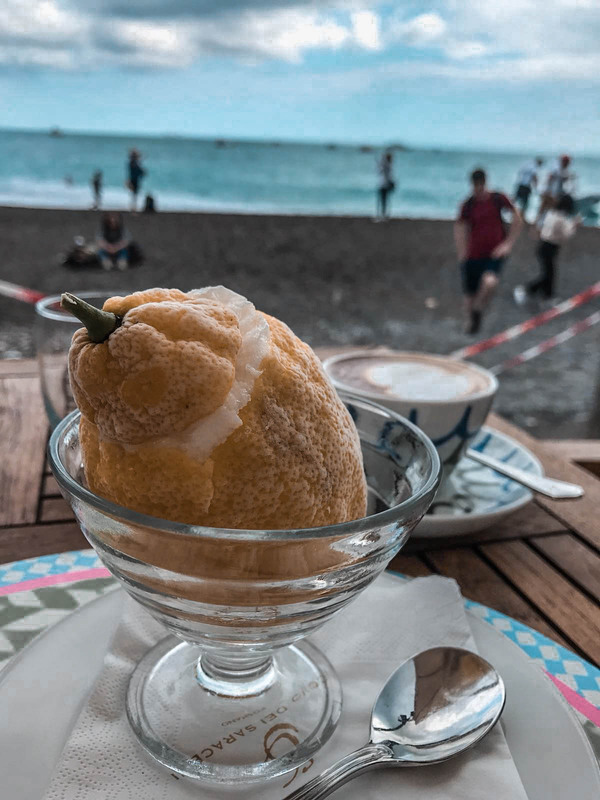 The hotel is famous for their sorbet, which is a sorbet-like no other, freshly made and served in a succulent Amalfi lemon. Delicious! Both situated right next door to one another, and offer the same type of vibes. Go to any of these and enjoy the art of apertivo and fabulous sundowners. 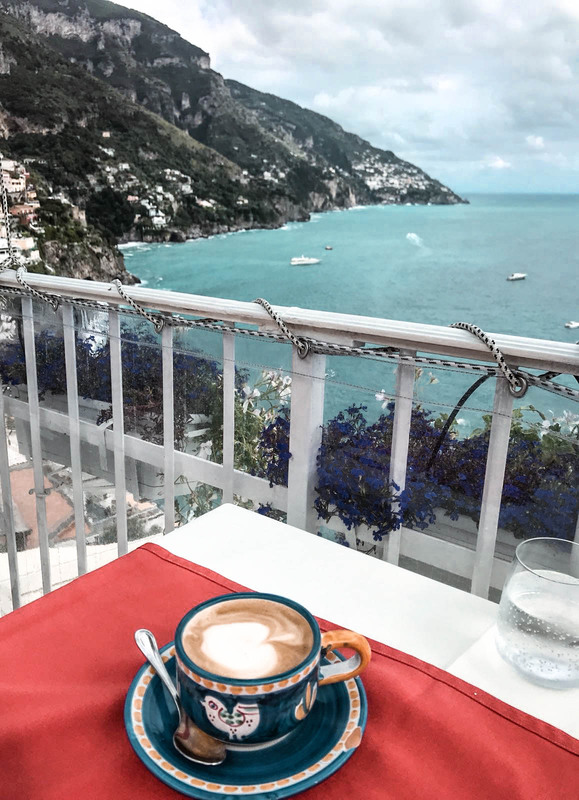 Luckily, in Positano, you can eat as your heart’s content and easily be able to burn off the carbs afterwards, as the town has a lot of steps and a lot of walking is required… But balance is key right?! Following the narrow streets down towards the bottom, you’ll reach the centre of the town. Here there are beautiful boutiques, bakeries and stalls where you can purchase unique paintings or splurge on gorgeous made to order sandals. 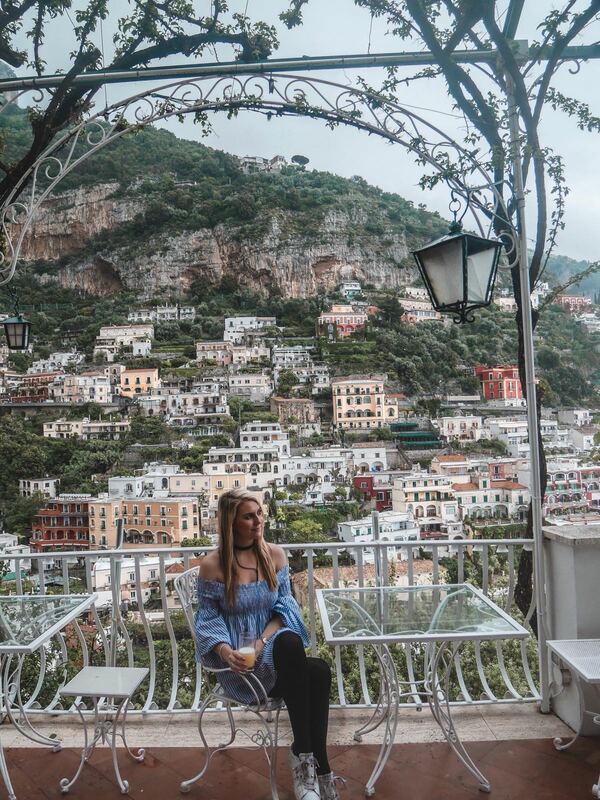 Sitting on one of the charming terraces, overlooking Positano and drinking fresh lemon juice was delightful. The lemons in Amalfi are famous in their own right, growing in abundance from trees that cling from the cliffs. Pretty much anywhere you visit in the Amalfi, will have lemons as a prominent feature, with my favourite, limoncello offered at the end of every meal. Amalfi lemons possess a unique sweetness from the combination of volcanic soil, warm weather and mixture of rainfall. Although we didn’t have time during our visit, next time we really want to drive through and explore the area more, visiting nearby places such as Amalfi Town, Sorrento, Faro and take a trip to Capri. Positano has some great beaches where you can rent beds for the day, and lounge all day watching the boats bobbing along the bay, bringing in day trippers. 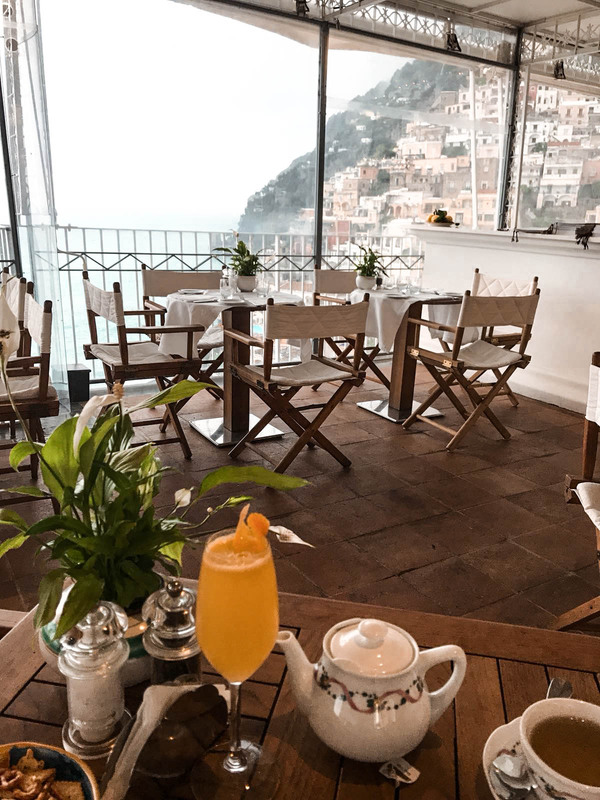 If the beach isn’t your thing, then relax on one of the many beautiful terraces Positano offers, take in the surroundings and enjoy a bellini or three. I would have loved to have rented a car, and had visions of us driving through the romantic Amalfi like a movie star, however, we were pretty limited on time, so this didn’t seem like the best option! Hiring a car is pretty simple, there were few desks at Napoli Station where you can rent a little fiat 500 from €65 per day. The drive then from Napoli to Positano is around 1 hour 30 minutes. Please note that most hotels in Positano will charge around €25 per day to park. The best option, especially if you have heavy bags & suitcases. The train from Napoli Central Station to Sorrento is about an hour, then you jump in a cab or arrange for a driver (surprisingly the cheaper option) to take you to Positano for €60. For the best rate for a private driver, please see here. The cheapest option, but you need to factor in a little time! As above, take the train to Sorrento, then take the bus to Positano, which takes around a 1 hour 15 minutes. See bus timetables and prices at Sorrento Insider. Bit of a rip-off, in my opinion, however, a guaranteed hassle-free way to travel! Taxi from Napoli train station starts at €130 to Positano, or as above, arrange for a driver to pick you up for a cheaper rate. The Amalfi’s most photogenic town, Positano is a real jewel of the region. With its stunning coastal views, naturally beautiful landscape and colourful houses – it’s no wonder thousands flock to the picturesque town every month!